EU Referendum: Double your money! 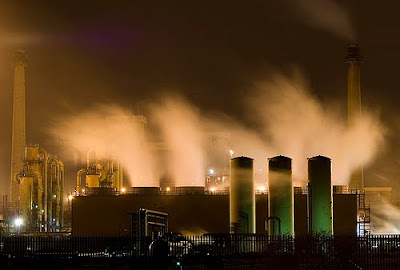 The EU's emission trading scheme (ETS) may have been the deciding factor in the closure of the Corus Redcar steel-making plant – reported last week , giving the company a windfall bonus of up to £1.2 billion from the plant closure – on top of other savings. However, revealed by The Times today (although the information has been available since June is an illustration of how valuable an alternative product - "carbon allowances" is to the group. The paper's story focuses on the rival ArcelorMittal group, pointing out that it has accumulated 20.8 million surplus allowances (EUAs) given to it free by the EU. With the carbon price at over £13, they are worth about £270 million. But, with additional surplus allowances up to 2012 and an increased carbon price – expected to rise to £30 - the company could have gained assets worth around £1 billion. While this applies to ArcelorMittal, of the three big benefactors of the scheme, the second is Corus. It has accumulated a surplus 7.5 of million EUAs (The German ThyssenKrupp steel group is third with 5.6 million). For Corus, the current value of its windfall is £100 million and, with an increased carbon price and its additional allowances, the asset value of its holdings could amount to £400 million. The decision to close Redcar – alone of the European plants to go - must also have been influenced by other factors. For instance, as well as the €20 million EU and government grant to its Dutch operation, the company points out that, in the Netherlands, "it has started to benefit from a government short-time work scheme under which a proportion of employees' salaries is paid by the state in return for in-house training during those periods in which they have no work." No such similar scheme exists in the UK which would have further weighted the balance against Redcar. Add the £1.2 billion windfall and the company could hardly have made any other choice. The ultimate irony, of course, is that the net "carbon" saving is nil. Nevertheless, all is not lost. In May last year, the local paper was parading the "green" credentials of the plant. The company's 3,000-acre site at Redcar, it said, was "also home to wild flowers and wildlife and the land borders a site of special scientific interest." It looks as if Redcar is about to gain a whole lot more wild flowers and wildlife.